Silkie’s Freebie | Kaleido by Silkie B. This is my very first time… so hopefully you guys understand what I trying to say… also, please let me know what you think!!! This tote bag is made with Ella Rae Classic, but it can be subsitute with any felt-able Aran/worsted weight yarn. The decorated flower is made with both MC and CC and the leaves and stem is made with Brown Sheep Nature Spun yarn. The sizing for this purse is only for reference. The final size of the purse is very much depending on the knitting style of the knitter and the length of the felting process. The Wendy tote bag is knitted in a round, the purse bottom is made separately and the purse body is knitted by picking up sts from the purse bottom. The purse handle tabs are made by picking up sts from the top of the purse body. This pattern is written for 4-rows stripe version, if you prefer a single color version, just simple double the MC yardage and ignore the color change in the direction for purse body. Purse Bottom is knitted using garter sts. To start, use MC and cast on 40 sts. Knit for 24 rows, end with WS row. Purse front is knitted in a round using St st and the sts are picking up from the purse bottom. To start, with WS facing up, start by picking up 40 sts from the cast on side, place marker (pm), pick up 12 sts from the side, pm, pick up 40 sts from the cast off side, pm, pick up 12 sts from the side, total of 104 sts. Before starting row 1, you will need to fix the yarn to the correct position to start. After picking up sts, the yarn tail is actually on the left-hand side, in order to start knitting in the row, bring the yarn to the front, slip marker (SM) to the left, then slip the 1 sts from right-hand side to left-hand side, bring the yarn to the back, then slip the 1 sts and marker back to the right-hand side. Start row 1 by using MC and knit in a round for 3 rows. Please be sure to move the marker along while knitting so you know where is the start of the body and where are the sides of the purse. After 3 rows in MC, switch to CC and knit for 4 rows (4-rows stripe). These 7 rows are the set up rows for the purse. The main potion of the purse body starts with * 4-rows stripe in MC and follows by 4-rows stripe in CC, 8 rows total. Repeat * 6 times for total of 48 rows. AT THE SAME TIME, work increase by following the increase instruction on the first row of these 8 rows. At the end of these 56 rows, 24 sts will be added and there will be 128 sts on the needle. Slip marker (sm) to the right, Inc 1 sts and knit to the next marker, inc 1 sts before marker, sm to the right, knit to next marker, sm to the right, inc 1 sts and knit to the next marker, inc 1 sts before marker, sm to the right, and knit to the end. The idea is to increase a st each at the beginning and at the end of one side of the purse body. At the end of this round, 4 sts will be added. To knit the top potion of the purse, start by using CC and knit for 8 rows, work increase for the first row of these 8 rows by following the increase row instruction. 4 sts added with 132 sts total. After 8 rows of CC, follow by 3 rows of MC. The next row is the start of the turning ridge. The turning ridge row is used to firm up the top edge of the purse. Fold on the turning ridge toward the WS of the purse, sew it in place. The double thickness on the top will give the firm up the top edge of the purse and help shape up the top of the purse. Lay the purse flat so that RS of purse front is on top, use MC to pick up 28 sts in the middle of the purse. Knit in St st for 15 rows, ending with WS rows. Bind of knitwise. Turn the bag around to the purse back and make the handle tab same way as the front. 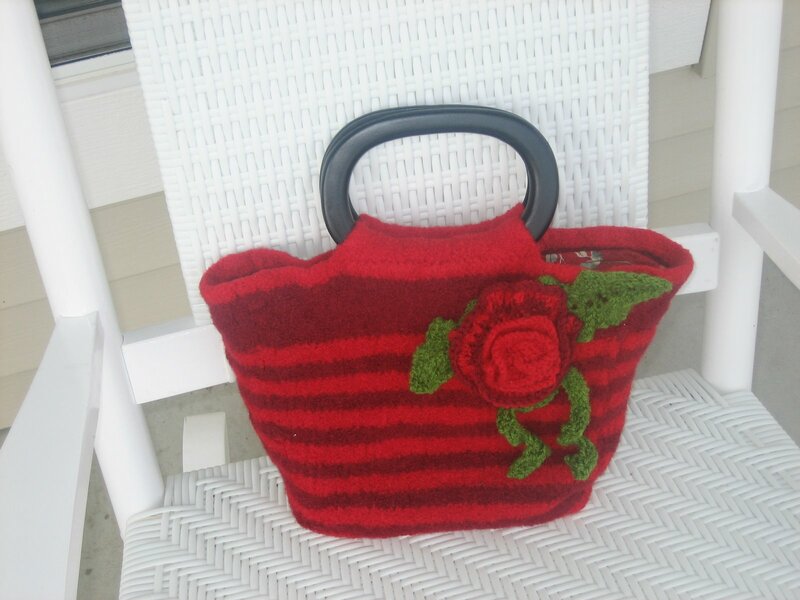 I have made the flower into 2 tones to bring out the red and the burgundy from the purse. If you prefer, you can knit it in one single color. Roll on the cast on side and form a flower, use MC and tapestry needle and sew the flower so that it will not change shape. Once the flower formed, sew the flower onto the purse, you can sew the flower anywhere you like on the purse. 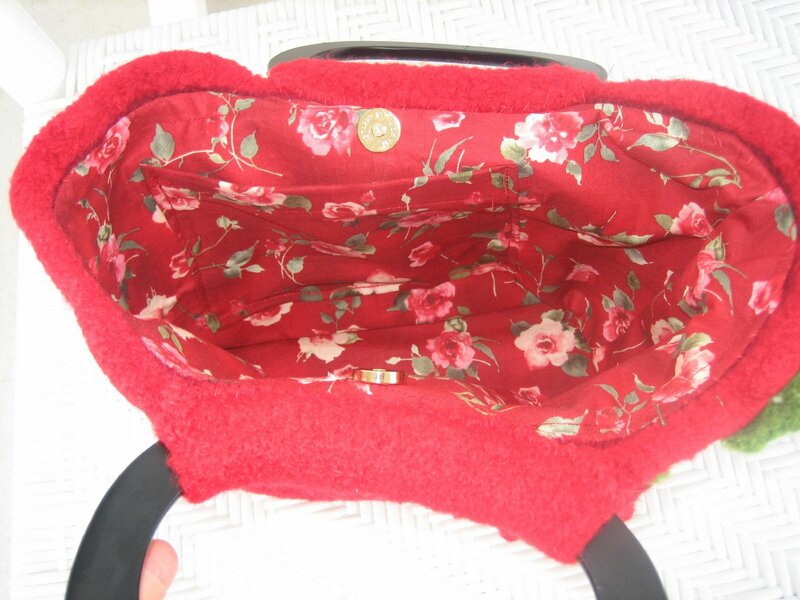 If you would like the flower on the corner of the purse, make sure to sew it at least 2” from the top. Once all the component is in place, the purse is now ready to felt. I would recommend to use a safety pins to pin the leaves in place, both of the stem and the outer part of the flowers. Use Hot/Cold water setting with the lowest water level, put the purse in a zip pillow case or mash laundry bag along with a pair of old jean, use a little bit of hand soap instead of detergent and start the washing cycle. Be sure to check the progress frequently, the felting length will vary depending on the machine. For the front loading washing machine will take a little big longer in compare to top loader machine. After the purse is completely dry, you can line the purse by using some matching fabric and attach a magnetic snap to the purse by following manufacturing instruction. I would highly recommend using the plastic canvas for the bottom. It will give it a little bit of body. I like to line my purse to give it a better shape. Also, you can go crazy with the fabric, it will give your purse a little bit more characters.